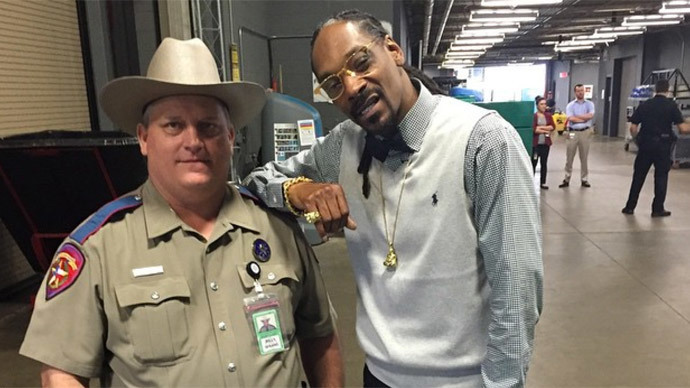 A spur-of-the-moment cell phone photo with a rap music legend has made a law enforcement officer from Texas an Instagram star...but the trooper’s selfie-with-Snoop Dogg hasn’t impressed everyone. Texas Department of Public Safety Trooper Billy Spears is being ordered to undergo counseling after posing for a photograph with rapper Snoop Dogg. An attorney for the officer, however, says the action reeks of retaliation. Spears was in uniform and providing security during the South by Southwest music festival in Austin, TX last month with Snoop Dogg, born Calvin Broadus, when he approached the officer and asked if the two could take a picture together. The image later showed up on the rapper’s Instagram account with the caption “Me n my deputy dogg,” and has since been “liked” by more than 18,000 users of the photo-sharing site. Spears’ superiors aren’t among those that are impressed, however, and have asked him to undergo counseling. The discipline notice will now appear in Spears’ personnel record, and an attorney for the trooper is calling foul. “This is not in their policy. They’re making this stuff up as they go,” lawyer Ty Clevenger told the Dallas Morning News this week. “Trooper Spears was not aware of Snoop Dogg's criminal history, nor was he aware that DPS personnel are expected to run criminal background checks of everyone who requests a picture,” he wrote. In a second letter sent to both the Travis County District Attorney’s Office and the local federal prosecutor, Clevenger alleges that the complaint was only filed because Spears “rocked the boat” when he complained about a colleague last May who had supposedly detained the trooper without probable cause based on a personal beef. Clevenger is asking the DPS to vacate the March 24 paperwork filed against Spears and wants the Texas Public Safety Commission and the Texas Alcoholic Beverage Commission to investigate the handling of the off-duty incident last year involving the colleague, TABC Sgt. Marcus Stokke.